From the day ARC opened its doors in 1984, business decisions have been driven by what customers need - responsive service and value with an eye for innovation. Today, ARC’s commitment to customers revolves around superior production and the most up-to-date manufacturing and research facilities. Our team of experienced craftsmen work to continuously improve all of our products, materials and processes. Our investment in the most up-to-date manufacturing facilities has allowed ARC to develop exclusive products and materials that are revolutionizing the FLEXO industry in every market segment. 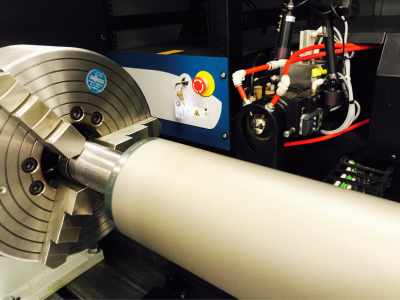 To maintain flexibility within a demanding anilox industry, we needed a laser system that delivers extensive graphical capabilities for rollers where cell overlaying, varying cell depth/diameters and unique cell designs can be incorporated with graphics. Employing a 3-D layered technique with intricate geometric, textured and organic designs, we can achieve sharp detail throughout all levels of cell design. Immediate, direct engraving means designs can be realized quickly. We now have brand new laser technology in our East and West Coast Manufacturing plants! Learn more about our new laser technology!